History - Bachelor - Master - Ph.D.
One of the first forest academies in Germany, lauched by Hans von Zanthier in 1772 in Ilsenburg (Harz); closed after his death in 1779. At the end of the 18th century in Germany academic education of foresters started at several places. Lessons on wood use became part of the curriculum early. In his famous textbook for foresters (Lehrbuch für Förster und die es werden wollen.) Georg Ludwig Hartig in 1823 pointed out that foresters need to know very well what kind of lumber a carpenter needs for which part of a house´s construction. Otherwise the carpenter would always claim the best trees for each purpose. So by knowing the specific needs of their customers the foresters would be able to secure an optimal use of the wood ressources. 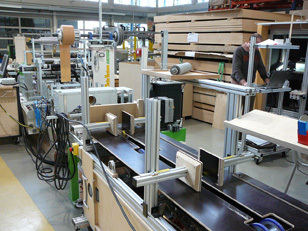 The University of Applied Sciences Lippe and Höxter is well equipped with a lot of latest woodworking machinery with can be used for tests an by the students for exercises. In addition to the more raw wood focused research and education at the older forestry faculties in Göttingen, Freiburg, München and Dresden/Tharandt, in 1925 a training school for wood processing engineers was established in Rosenheim (Bavaria). In 1971 it was converted into an industry-orientated “University of Applied Sciences” (Fachhochschule = FH). The FH Rosenheim offers a variety of applied engineering courses including four of them related to the woodworking industries: Wood Technology and Industrial Engineering, Wood Building Construction and Finishing, Interior Engineering and Master of Engineering in Wood Technology. In addition similar programs of education have been run for a few years at three“Berufsakademien” (“Universities of Cooperative Education”) in Mosbach, Dresden and Melle. These academies offer three-year courses with several industrial placements in between which guarantee an education close to industry practice. At the LIGNA-fair in 2005 the University of Hamburg presented a cube of 3 m3 volume which represents the wood increment in Germany´s forests per second. The first university curriculum focused on wood science and technology was developed and started at the former Forest University in Eberswalde near Berlin in 1939 bei H.H. Hilf. In 1946 the wood science school moved to Reinbek near Hamburg and then in 1960 to new buildings in Hamburg-Lohbrügge (together with the Johann Heinrich von Thünen-Institut (vTI: Federal Research Institute for Rural Areas, Forestry and Fisheries). More information on today´s curriculum of the University of Hamburg. Students of the M.Sc.-program Wood Biology and Technology visiting the lab of the Institute of Machine Tools and Production Technology (University of Braunschweig) which does intensive research on machining of wood and composite materials. Some of the lectures (in English!) became part of the new Erasmus Mundus MSc program in Sustainable Forest and Nature Management SUFONAMA which can be focused on forest products. There are about 25 scholarships for students from outsides EU or EEA/EFTA countries available for this program: each of € 42,000 (€ 21,000 annually for two years). In 2008, application deadline for non-EU students is January 25th, for EU students August 15th. At the University of Dresden there is another program with a very long history, called “Wood and Fibrious Technology” . It is run by the Faculty of Mechanical Engineering and therefore more oriented towards technology. In addition, together with the Faculty of Forest, Geo and Hydro Sciences a Master-program and postgraduate studies in "Wood Technology and Timber Industry" is being offered, awarding the degree of„Master of Wood Science and Technology“ (MSc. Wood). In Germany you basically can do a Ph.D. about a wood-releated topic at each of the universities mentioned above in section 3. A very special possibility is the Ph.D.-program “Wood Biology and Technology” which was lauched in Göttingen in 2002. • The program should be finished within 3 years. • Students can write either a dissertation or at least two publications in internationally-referenced journals. • In addition language courses (German / English) are offered as well as cultural trips, parties etc. • All courses are taught in English.